Like my last review (Langar Hall) I was afforded the opportunity to visit The Footman’s Rest as a result of judging the Outstanding Service category in The Nottingham Post Food and Drink Awards. Unlike Langar Hall I was oblivious to The Footman’s Rest before I heard it had been nominated. I was surprised by this as it lies not far from where I live and opened in the last two years. It’s in the funny part of Canning Circus between the Falcon Inn and the Sir John, hidden between the seemingly endless traffic lights. The name is not just a whimsical reference, the proprietor was an actual footman, to QE II no less. Inside you are treated to some black and white art deco tiling complimented by a fair amount of polished silver. It’s small but well formed. Their opening is limited to Weds-Sat and it’s mostly a drinks venue, come the weekend you’ll see patrons spilling out onto the street with posh cocktail in hand. 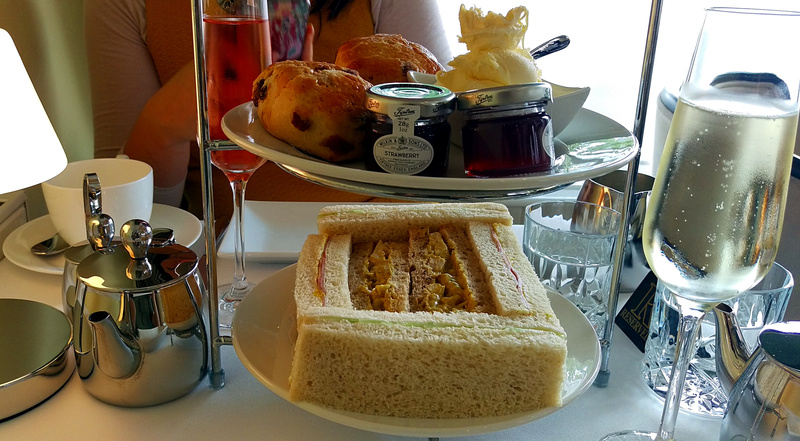 On Thurs-Sat you can also enjoy afternoon tea if you have booked in advance, fortunately we had done just that. The works will set you back £22.50, you can opt to add a glass of prosecco at £4 per person or £8 for a glass of champagne. Tables are laid out with the full silver service and really pretty although there isn’t much space once the full stand of afternoon delights arrived. The sandwiches made in-house were as neatly cut and pristine as you might imagine. My favourite was the coronation chicken, good curry flavour that had some depth over a cheaper version. Ham and mustard was good too, the right balance of the powerful yellow stuff but enough for a slight nostril flare as well there should be. Cucumber was the least exciting, could anyone be surprised by this? I think you would miss it if it wasn’t there though. The tea list was suitably extensive and I enjoyed a really good Assam, I lost track of how many cups I had. 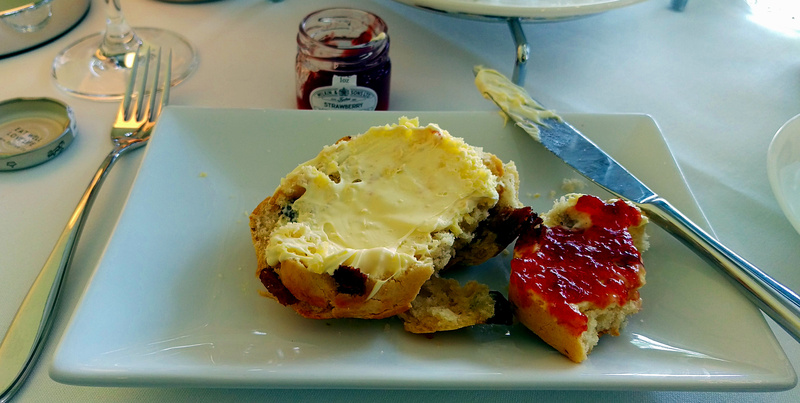 Freshly baked scones were really excellent, still warm and managing to retain a lightness alongside their classic texture. I liked the individual pots of jam too. Cakes and pastries are not made at the Footman’s Rest. That said, if you are going to buy them in then there are few better places than Hambleton Bakery. A millionaires shortbread style cake will be a popular choice, there was also an almondy number that wasn’t quite my cup of tea but well made. Macaroons were excellent too, plenty of distinctive flavour and pleasingly crunchy texture. We took away a couple to enjoy later on. As you might imagine from the winner of the Outstanding Service Category we were well attended to throughout. The real star is Steven, the owner and only member of staff for the majority of our visit. His consistent presence makes the place what it is and his experience in the royal household means he was clearly well practiced in the silver service, but it never felt too formal. The cost does put it in the upper echelons of Nottingham’s afternoon tea, with the popular Lace Market Hotel at £17.50 and White Rabbit at £15. Despite that price it seemed worth it for an experience that felt polished and exclusive, a deserving winner at the food awards.